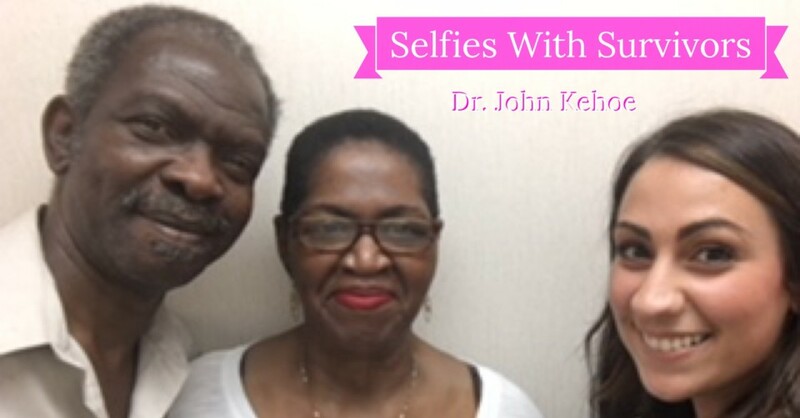 It is Sunday and I turn to a survivor (in the middle with husband and a former staff member) with a deep spiritual outlook on curing breast cancer. IN HER OWN WORDS: By the grace of GOD almighty I am a breast cancer survivor. I met Dr. Kehoe in 2000. 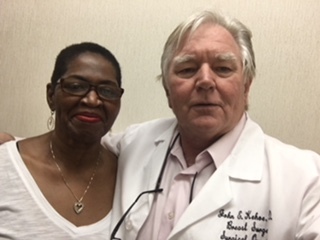 Prior to meeting Dr. Kehoe, I had been having my yearly mammogram. Two separate doctors who read the results always told me everything was good, clean and clear even in 2000. When I went to my primary care physician for my check up, he found something amiss and referred me to Dr. Kehoe. He concluded that there was something wrong. Dr. Kehoe proceeded to perform the necessary treatment and I have been going to him since. Now, doctors treat, but only GOD almighty heals. I thank GOD almighty that I am healed by his grace. To buttress this, when I went to church just a few weeks after Dr. Kehoe performed the surgery, a visiting preacher from another country pointed to the spot of my cancer, not knowing anything about me, and prayed for healing. I have a lost a tremendous amount of weight during my journey, down from a size 30-32 to 18-20 and I feel wonderful. Beating cancer gave me the strength to do this. I am an R.N. for over 40 years and continue to work in a career that I love so much. I have worked in a hands on position in the hospital. And now I work in the background helping patients in a silent role by overturning denial of services. I thank GOD for my doctors and pray that may God almighty always guide and give them the knowledge and strength to continue giving treatments to their patients with good and happy outcomes in JESUS CHRIST’S name. Amen.